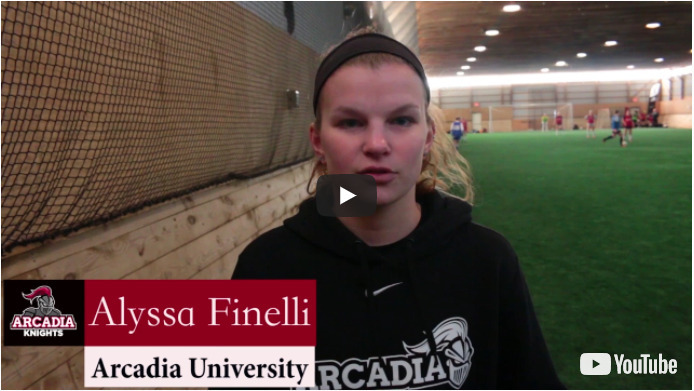 Alyssa Finelli from Arcadia University reveals the secret to getting any college coach to watch your highlight tape. "Number one I would say quality of the video. You wanna make sure it's not pixelated, it's not fuzzy. The person recording it is elevated from a high angle, they're not sitting. Also, we can easily tell your number, who you are. There should be something that identifies who you are immediately. You know, circle the player, you highlight them or there's an arrow pointing to them. Something else is if the video is too short I'm gonna stop watching it because I can't really see anything else if it's just one clip. If you have practice footage, you running different drills, different foot skills, shooting, that's fine, but make sure you also have in game footage as well. So, we also want to see the play develop. We wanna see you making runs on and off the ball. We don't just wanna see you receiving and passing. We want to see the play develop and you moving off the ball. Music is another thing. You just have to be careful with what music you put in it. You wanna make sure there's no profanity, nothing bad in there. If you wanna put it in there that's fine, just make sure it's censored and acceptable."